Edmonton has a highly developed roadway network connecting the region, the country and south through the U.S. and Mexico – ensuring safe, efficient road service to Alberta’s resource-rich areas and to continental markets and key ports. The Yellowhead Highway and Trans-Canada Highway are the major Canadian east - west connectors. Alberta is also connected to key U.S. and Mexican markets through the Canamex Trade Corridor. Edmonton is situated on the Yellowhead Highway. The city connects through Highway 2 to Canada’s southern Trans-Canada route and is the northern-most point of the Canamex Trade Corridor. Edmonton is also an important transportation centre on the Ports to Plains Corridor route linking the Port of Prince Rupert through the prairies and major Midwest U.S. cities to the Texas gulf coast. 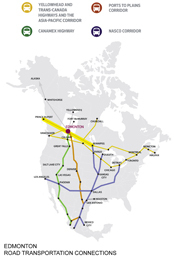 Edmonton is also linked into the North American Super Corridor (NASCO corridor) with highway connections to Midwest and southern U.S. markets and ports. The Anthony Henday Drive ring road significantly eases travel around the city. It has also facilitated significantly more efficient travel around the Capital Region, especially northern and western transportation logistics sites to the international airport and Highway 2 south. All Edmonton’s industrial districts are adjacent to major highways. There is a designated route to move high, heavy loads from the Edmonton region to oil sands projects in northern Alberta.